Spring time awaits us, and a trip back to the Big Apple called me over - so the invitation was accepted. Instead of living over in Greenwich Village in the city, I needed a different game plan. It was decided that Brooklyn would be the base location. 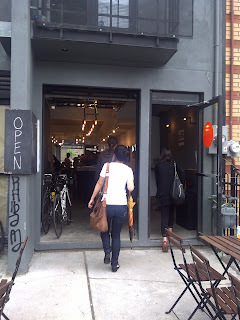 In particular Williamsburg, located on the L line - it seemed fitting for a visitor to have the best of both worlds. The city within 10-15minutes on the L line and the local artisan feel of emerging Williamsburg. 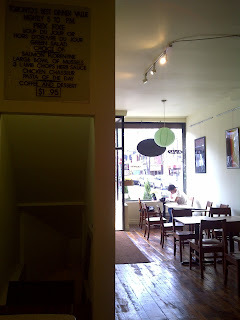 Being impressed with Cafe Grumpy, and Oslo - it made me want to become a local for the week that was to be spent in NYC. H Factor in full force! Team Canada let's GO! Bit of a rain delay - but BK we got you. 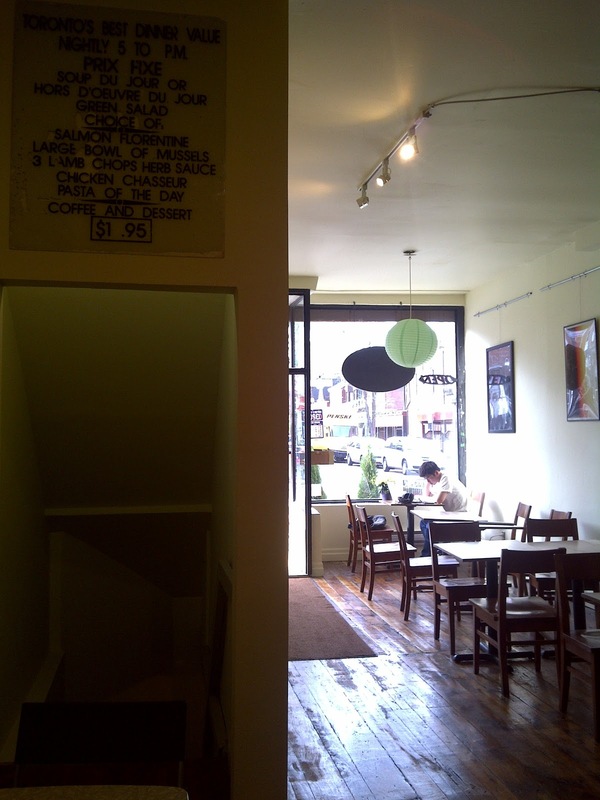 Located in the Market, it seems that even Kensington can't be over saturated from Cafes. Counting more than a handful of locations seems that we are not short of options. Start of the summertime fave - Pedestrian Sundays - Car Free Zone during the last sunday of May til October meant that there would be crowds. We welcomed the celebration with open arms as drones of Torontoians gathered to soak in performers and artists, while food vendors filled the air with succulant aromas. Everywhere you looked around - people were enjoying the weather and strolling through the glorious streets without a worry. Address: 72 W 38th St. 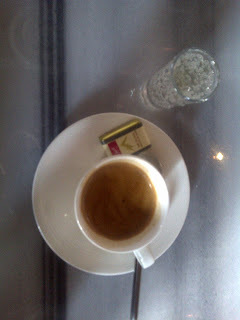 Serving Flat whites, raised eyebrows... Found out that the owners are from Sydney, AUS. With wall to wall window-front, it's a little hidden as there is some scaffolding outside, but chalk drawn signs help you find your way as your coming off of 6th Ave. (Avenue of Americas). Once you walk in, there are friendly staff to greet you, with two decadent chandeliers hanging from the rafts. 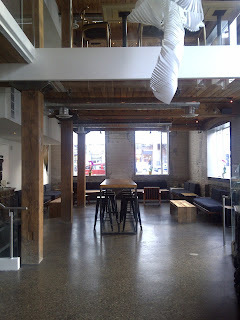 Narrow 6 seater counter located in the middle, window marble topped bar allows for people watching and a soft banquette and 3 wooden tables fill the rest of the space. 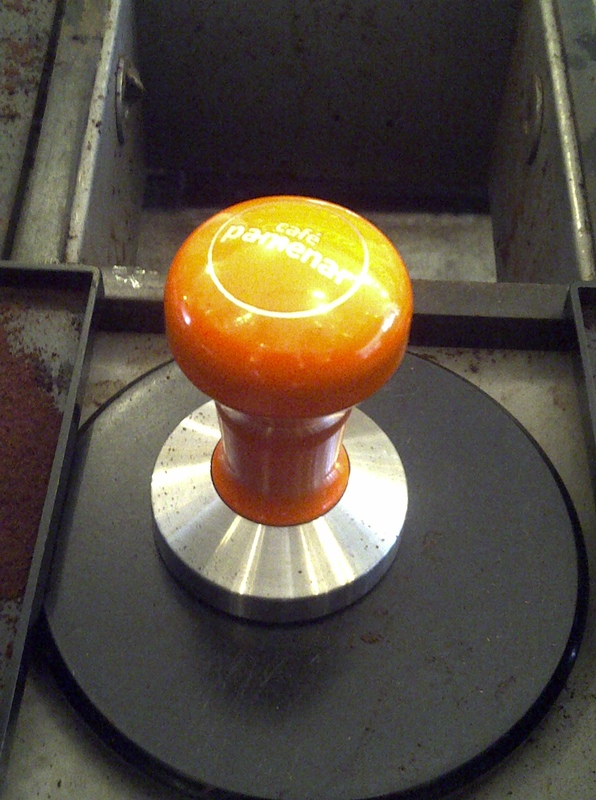 Machine: 2 group Cyrna Synesso. Special Feature: Cooper Piping Brew Bar, using Beehives for single cup brewing. Verdict: longer than normal tight triple ristretto NY syrupy shots, it's full of bright notes of blueberry, chocolately goodness. 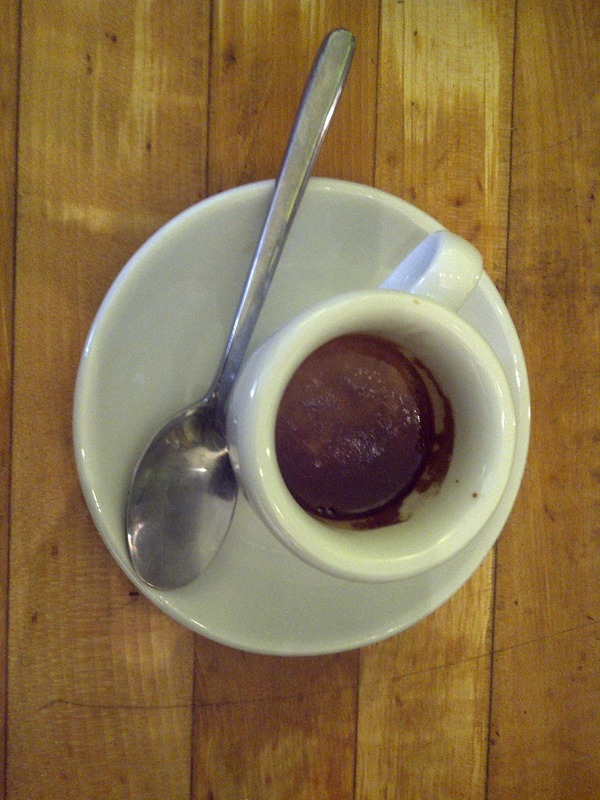 All shots are triple ristretto. Is it a NYC law to wear chapeaus? I'm noticing this trend...every since those charming chaps at Stumptown (ACE hotel) swooned me over. Here's my tribute to the empire that is quickly challenging Torontoians affinity with Coffee. Tea is the new Black. 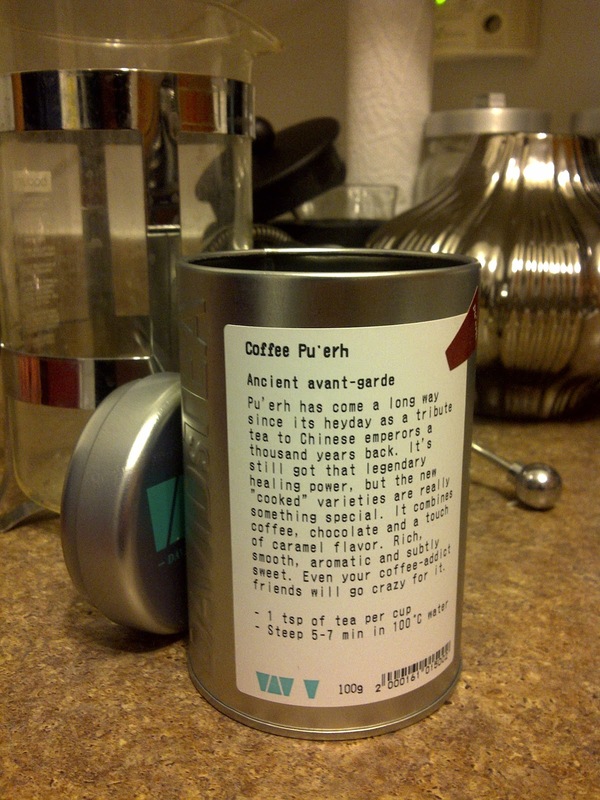 Veridct: It's very chocolately - and if steeped a little bit longer it's aroma are quite similar to caramel swirls. It already has a great tea-like taste. Can we substitute this for the real deal...... if you're MAD! It's a great starter point for tea lovers - but coffee haters. If you've also noticed the green grass on Spadina, you're not the only one. After 18 months of construction, Louise and team are ready to launch this spot for competitive accommodations within the walks of downtown. Looking at a June launch, they've been running their reception area/lounge/lobby since March. A full service 24-hrs concierge desk acts as bar/and espresso spot for hotel goers and locals alike. The Loft style, open raft space with exposed ventilation pipes makes the space work in the design conscious area. Let's not forget about all the architecture/design firms located on Spadina.. Along with the savvy Robertson Building just a couple steps north. Can this lobby compete with Dark Horse 2? Not really - it's just different. They cater towards different crowd, with a more lounge hangout spot, as opposed to full suite cafe work centre at DH2. You won't really see too many people on their macbook pros typing and designing away in this spot. You're more likely to see groups of friends gathering for a mid-day drink, or after-hours gathering. Equipped with a full continental menu you might find something to noosh on. Nicaragua - high end crispness. Verdict: Attention to details such as a shot of sparkling water, is definitely a great touch - they must be trained from the boys at TeAro. Sadly, this shot was weak - watery, and no syrupy body. Having had a lot of Big Bro - I'll have to say that this shot does not live up to the potential that I know it can be. 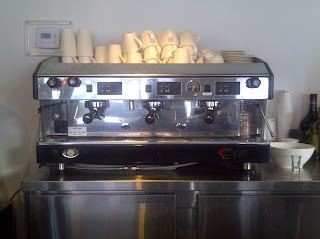 Beans are great - if factors can be controlled, and dedicated baristas start to stay - but for now - get yourself a stiff drink. 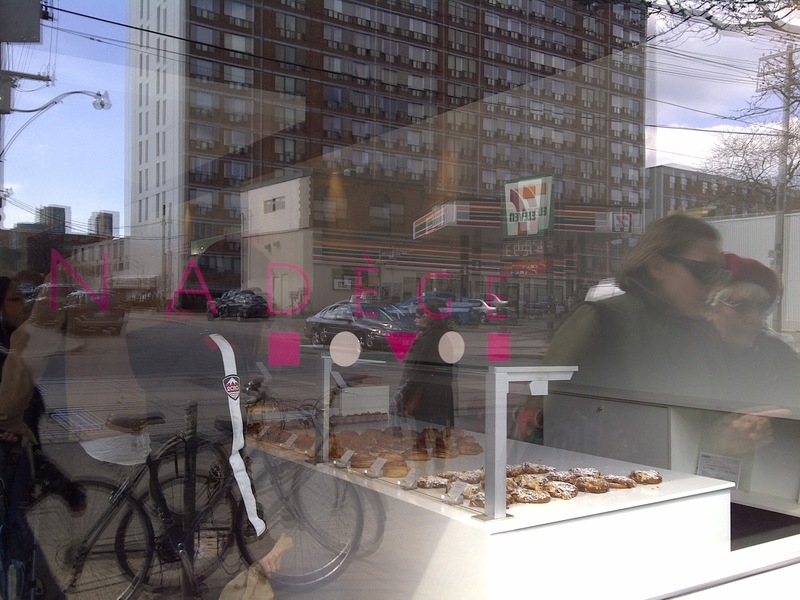 Continuing on with our Crossiant series brings us to Nadège Patisserie located in hustle and bustle of Queen West - right across from Trinity-Bellwoods Park. This space has won the ARDIO award, Design Exchange Gala Award and no kidding the place is amazing. Smack dab in Central Toronto with an in-house made French bakery in the back/ full force patisserie and showcase in the front perfectly lined with white chairs, tables and counter space. You'll find it's always packed - but more so on the weekend as 9-5ers get their fix of decadence. 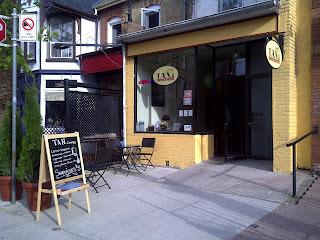 Address: 983 Queen East, 135 Ossington Avenue. Cold-extraction brewed for 8 hours with one pot being brewed overnight in some cases is on display at both locations run by Te Aro. 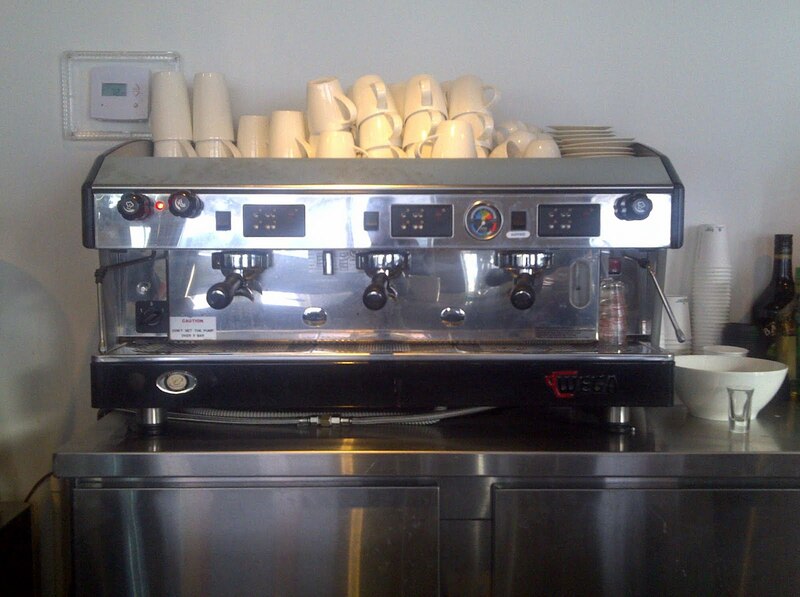 You might be able to catch the coffee equipment in action if you get there in the morning. 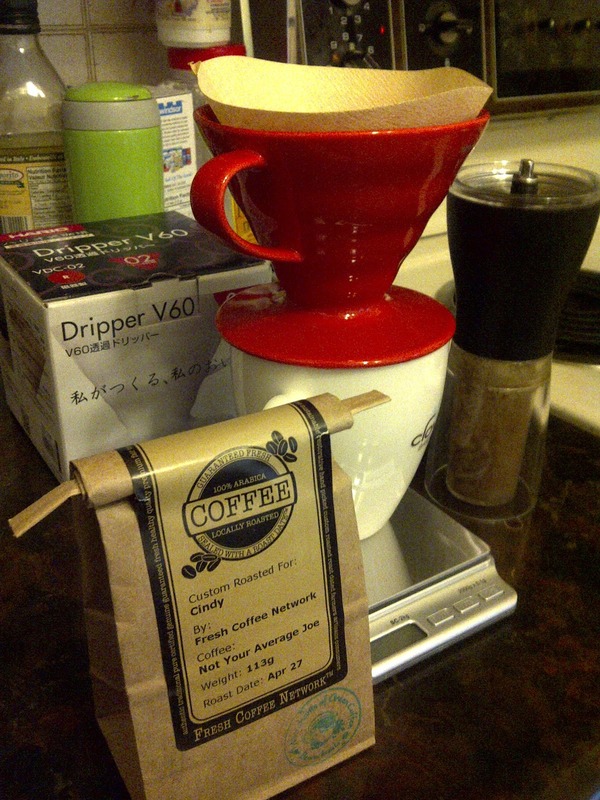 The cold-process coffee system is a no-tech, extraction method using cold water and coarsely ground coffee beans. 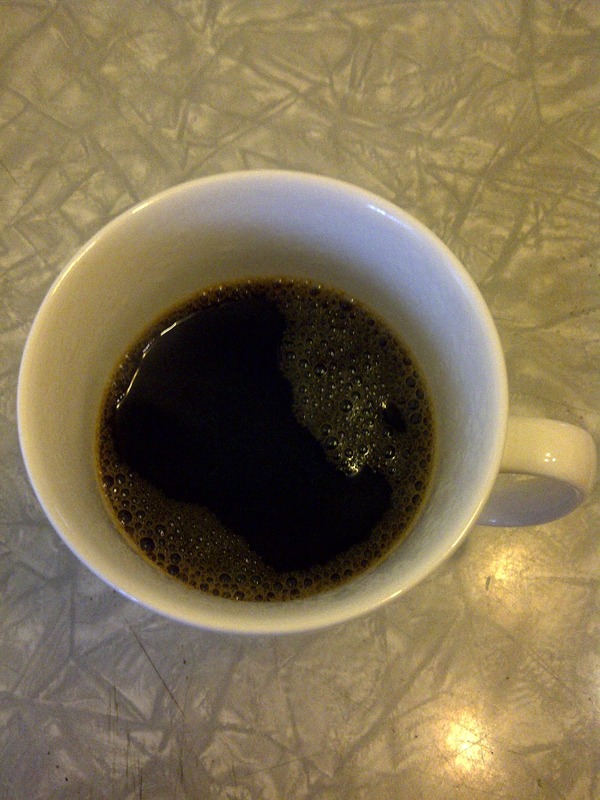 This means that the bitter compounds and the acidity associated with traditionally brewed coffee is gone. 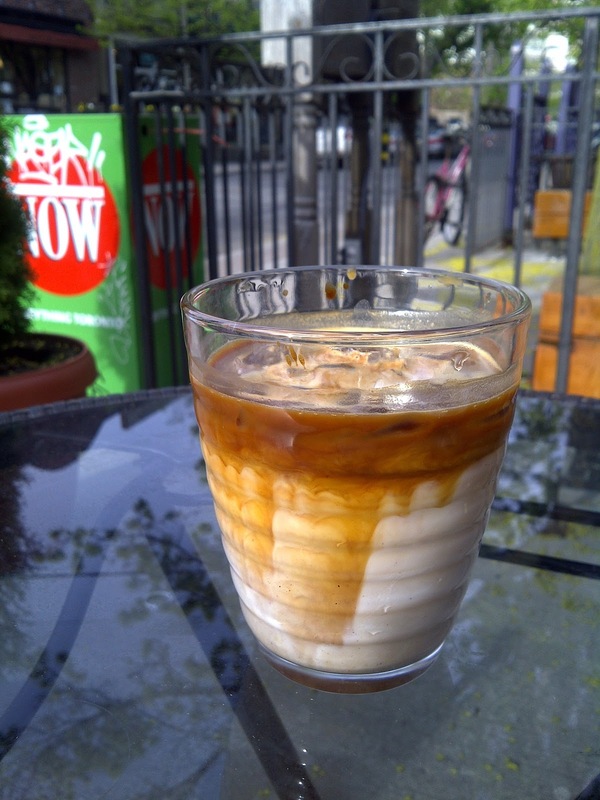 For those looking for coffee that doesn't turn our tummies, or something to enjoy on hot weather-patio appropriate days ahead, it might be a good idea to give this type of brewing process a taste. 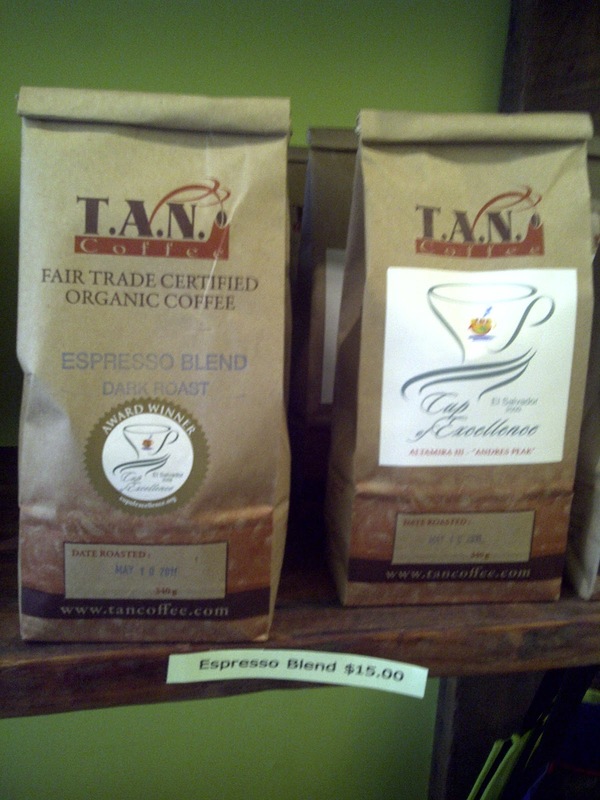 Colombian (on the left)-dark syrupy chocolate, big punch! I choose this one. Little Bro (on the right) - lighter, more floral subtle citrus punch. Jasmine Tea like. Price tag: $4 for 6oz. T.A.N. Baldwin Village as been on my to-visit list for a while, and seeing as it's tucked away in the heart of Downtown, in the bubble known as Baldwin Street it was a win-win for everyone. The cafe has been in operations for 2 months, and they're already collecting a reputation for regulars. Painted in a summer glow of yellow, with white walls and nicely decorated interior, it's getting the right sort of attention. 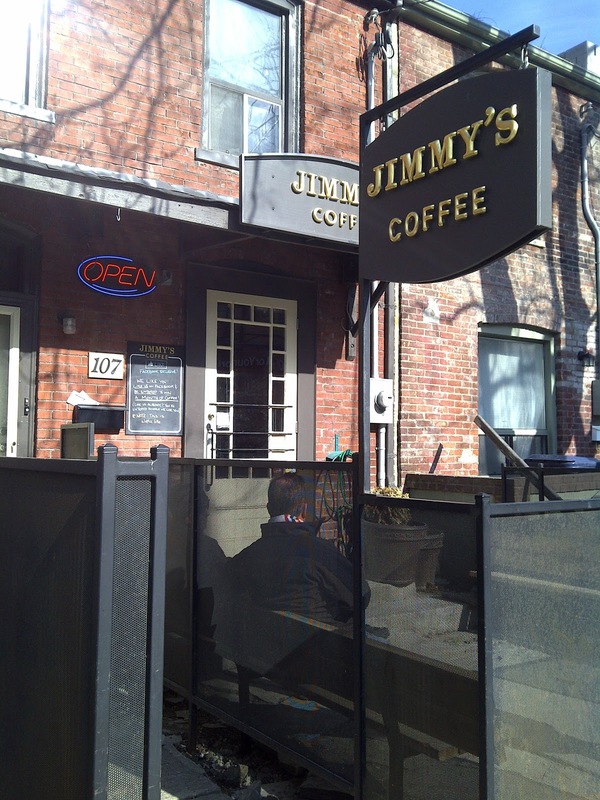 With a two table patio "fenced" off by a couple of large plants, it's a great patio to enjoy the iced drinks of the summer. 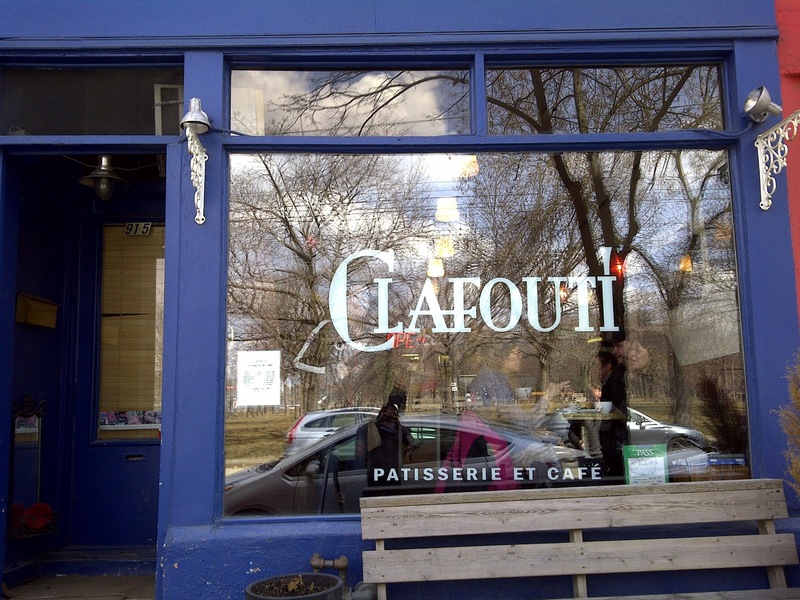 The north facing cafe allows ample sun in with a large glass storefront. As you walk into the long narrow cafe, the wooden floors with wooden patio-style tables and chairs creates a nice haven to sit back and relax. Located near student campuses of UofT, OCAD, and Michener many stop in to enjoy the free wifi. Verdict: Nice mellow HUGE Chocolate flavours, meyer lemons, very distinct clean mouth feel. Rounded brightness as the espresso start to cool with a molten chocolate cake texture. Ooozing with syrupy goodness. Will I be back - 90%. Queen West. But i love the downtown charm of this shop. 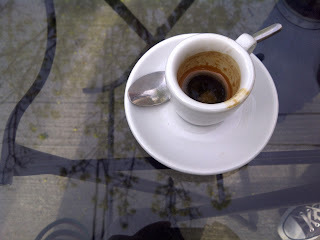 Espresso Adventure for the long weekend. Trying to see how many cafe patios I can ring up! Thoughts about NYC -- I'll fly over. Labels: Baldwin Village, Downtown, T.A.N. 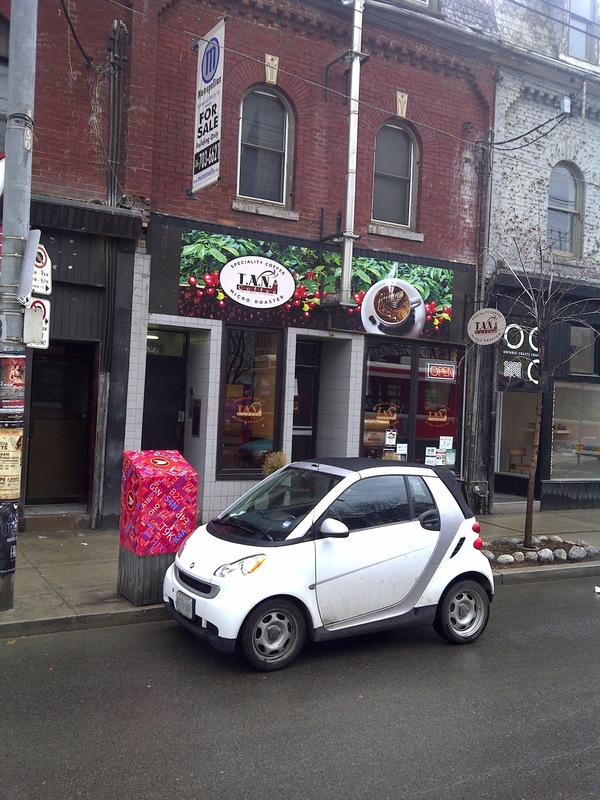 Quiant Coffee in the hustle and bustle of King West? Let's be honest here, it's an amazing location smack-dab in Central Toronto. Where does it find it's place in King West and Fashion District land where the hordes of condo-dwellers come to sip their sorrows away. They've created that need, and they neighbourhoodies come in drones.Let's just say, it's a great way to people watch on a weekend afternoon. All the sunglasses and chic comfort wear, clearly just waking up to grab their "morning" brews. But that's an over generalization, it's charm can win over the most toughest critics. A once kept secret, is exploding at the seems for fresh faces to destroy their secret hiding spot. Where do you hit up when you're in one of those weekend ruts? 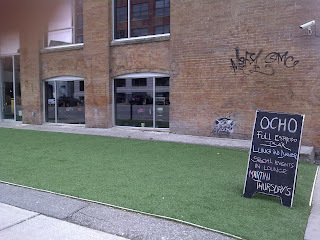 Switch it up by heading to Trinity-Bellwoods and people watch. Across the street from the urban park is home to Clafouti. Timing: 35s Pre-Brew, 3:40 Total Brew Time. Verdict: Nice smooth blend, not really pushing too far in the bright category. No eye-defining features, but a nice overall smoothness that is very centrally minded. This blend is defined as medium, and it's very neutral. 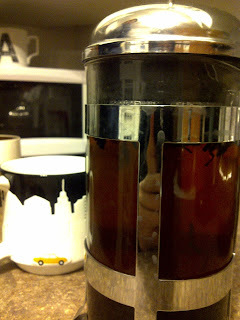 Gets more punchy as the coffee cools, allowing the Ethopian florals to come out. 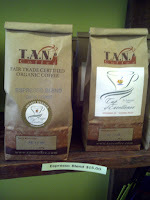 Final Thoughts: Great to win over non-indie coffee drinkers that are looking for some middle ground. 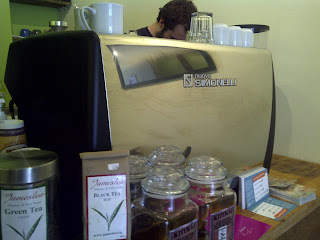 Samuel from Keffa Coffee will be in town and so will his Ethiopian Coffee. Detour Coffee and gracious hosts Dark Horse 2 will be holding a special Coffee Cupping. Ethiopian Food prepared by Samuels sister to follow and latte art throwdown!